I know I know, I've wrote the review about this amazing movie. To point the title, why 2.0 is because, I'm going to tell my thoughts about this movie and the movie novelisation. Yes, you read it right. There's an official movie novelisation out there. I got mine here. The movie itself hasn't available for pre-order yet, hopefully soon. 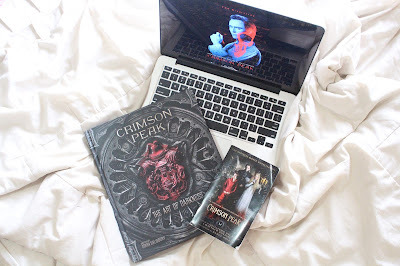 As I read the whole story, deeper than the movie, I realised Crimson Peak deserved more attention. Like I said in my first review, this movie is visually stunning and beautiful. All the details will catch your attention, even the smallest things. People kept saying it's all the CGI but the director, Guillermo Del Toro and the special FX makeup artist, David Marti, revealed behind all the beautiful creepiness about this movie, some sort of like behind the scenes. We didn't see the entire process of course, we all only see pictures but that's enough to prove that the CGI effects only add some more of beautifulness, creepiness to the movie. I terrified to see Tom's and Jessica's dummies, both looked ridiculously real! GDT known as visionary director because everything inside his imagination, he makes it real. And for me, I watched some of his movies like Pan's Labyrinth, Hellboy movies, Pacific Rim, it all are so beautifully done. Like if this movie has to be hella creepy like Hellboy, that bam! or if it has to be super imaginative like Pacific Rim, he can do that well. But this movie, I feel like this is his work at his best. He put so much effort and love to Crimson Peak. He involved in so many ways even he gave each main actor about their characters' biographies. No director ever do that, right? It was usually the actor who do that, like doing their own research to develop and to understand more about their characters but GDT wants the actors learn more from both the characters biography and their own researches. And I think it worked really well. Each main character in this movie was played very well by each actor. It's pity Crimson Peak only get 6,9 points on IMDb or 69% on rotten tomatoes. I don't understand why. This movie is beyond our imagination. It delivers a simple plot line with darker story in it and also visually beautiful to see. It's nothing like other gothic romance where everything has to be dark and creepy, Crimson Peak still has beauty, sweet and romantic side apart from romantic scene and lines, the set itself is quiet romantic. Like when Edith and Thomas kissed in front of the hotel room, I think it was so beautiful. We got to see a little bit of silhouette and sunlight behind them peeking through their faces. That was so beautiful, sensual and romantic. Allerdale Hall is beautiful. I don't know what everybody thinks, but I think this is the most beautiful set on gothic romance movie I've ever seen. I really wished there's a real Allerdale Hall somewhere and they make it to be a museum or something. I heard that there's Crimson Peak on Universal Horror Nights but for an actual museum, I don't think they've thought about it yet. Please be real! The grand entrance or main entrance is beautiful. It's so wide and big, like a castle's grand entrance. The main bedroom is also magical, I can't explain. Every detail in this movie is beyond magical, beyond beautiful! Let's talk about the novelisation by Nancy Holder. This is one of the rare moments when I saw the movie first before I read the book. Having seen the film few times, I was so interested to see how many changes or pieces of additional information might feature in the book version. I was thrilled, beyond happy to find that the book detailed more of Thomas and Lucille's childhood and early years. 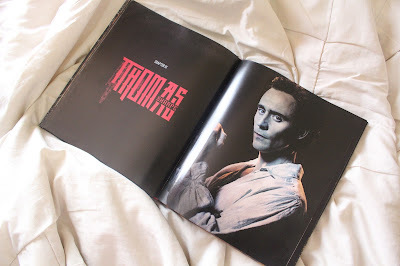 Crimson Peak novelisation is beautifully written! Nancy has a wonderful way to paint with words. It is full of imagery and internal thoughts. Characters development, additional stories (or perhaps original scripts before GDT has to cut it off from the movie due to duration) and some more of details about The Sharpe, everything fit very well in Nancy's words. There's a moment when I read the book, I forgot that this book based on movie not otherwise. The book really answers any questions you might have after seeing the film. I got mine in almost every question I had on my head while I watched the movie. After reading this I can really understand why GDT keeps emphasizing that this is not a horror, it is a Gothic romance, the story is creepy and gets under your skin, but it certainly is not a horror. As I read every word, every character's thoughts, my head keep imagining the movie and can't get enough how beautiful, great story line, great actor choices to portray every character in this story. I can say this is the best gothic romance I've ever seen in my entire life! The more I read, the more I fall in love with the characters! I was right when I said GDT put his best at Crimson Peak. It was proven by how Crimson Peak has made and all the mystery was develop inside the Crimson Peak: The Art of Darkness. This book told us everything we want to know like inside the house, character's costumes, character's biography even the house plan! I got mine from here.